Jiang Wen's Let the bullets fly was Christmas 2010's mega hit movie in it's native China. It's easy to see why, it delivers massive star power, some impressively staged action, a sly political edge and most importantly, a lot of fun packed into its running time. A bunch of well drilled bandits lead by Pocky Zhang (Jiang Wen) hold up a train carrying Bangde Ma (Ge You) and his wife (Carina Lau). Bangde has bribed his way into becoming the governor of Goose Town, where he intends to hook up with the rich and exploit the poor in order to become rich himself. Zhang decides to take over the position and keep Bangde as his aide, when they arrive in town it soon becomes clear local gangster Huang (Chow Yun Fat) really runs the show. So begins a titanic battle of wits between Zhang and Huang. Immensely entertaining and often very funny, Let the bullets fly is easily Jiang Wen's most accessible and commercial film to date. 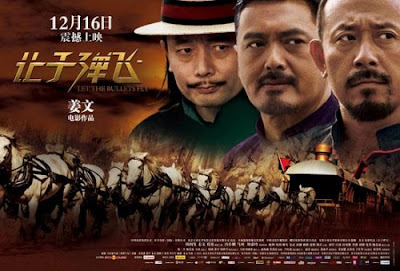 Sumptuous to look at, thanks to the fantastic production design and cinematography and superbly acted by all concerned, particularly Jiang Wen and the scene stealing Chow Yun Fat who has his best role in years as both Huang and his idiot double he uses as a decoy. The best feature of the film is undoubtedly it's rich, densely packed screenplay, for many western viewers however, this may also be it's worst feature. The dialogue is delivered in such quick fire fashion that the subtitles zip by and you may have trouble keeping up. 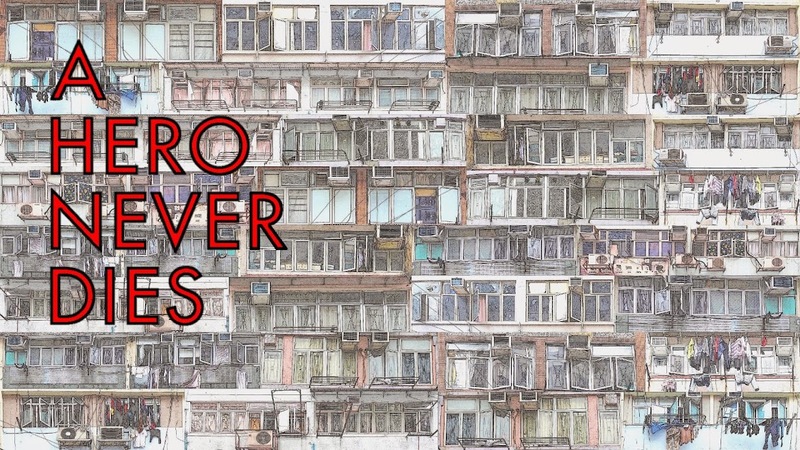 Added to this some of the humour is lost on a non Chinese audience as it doesn't all translate and requires a healthy knowledge of Chinese culture to fully appreciate. While many bullets are fired during the film, the banter between the characters is the real summation of the title, verbal bullets flying rather than actual bullets. All that said, enough of the humour does come through but such is it's richness I can't help but feel I'm missing out. The only issues I have with the film are some atrocious CGI moments that are so bad they can only have been intentional, why this would be the case though I'm not sure! The film is also pretty long at 2hrs 12 mins and perhaps a little trimming could have made it a little tighter. 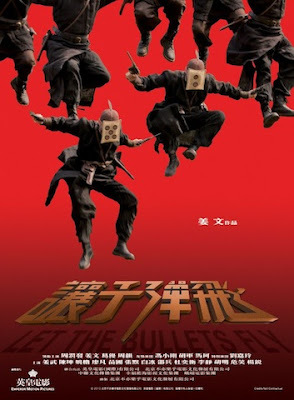 One of the most interesting things about Let the bullets fly are the political overtones that seem to have been missed or perhaps ignored by the Chinese film censors, who are usually so renowned for being strict on any kind of political commentary that paints the Chinese government in anything less than perfect light. 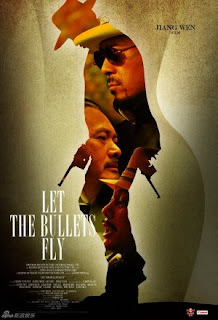 Let the bullets fly may not be the movie you were expecting, the impression I had of it from it's promotion was of a comedy action western, and with that title and Chow Yun Fat starring I was hoping for an element of heroic bloodshed, this is not the case however. Don't let that put you off though as it's an excellent film, with much to offer the attentive viewer. So successful was the film that a sequel has already been given the green light, proof that intelligent and entertaining movies can still be commercial movies! Yes, I've heard nothing but good things about this one...but every good opinion of it is also with the addition of the fact that a lot of humor involves wordplay that non-native speakers will lose. It's the only thing holding me back on this one. Thanks for a very good review. I finally have a good idea of what the movie is like. You're the man, Hero. Keep writing, please! Wes, I know, nothing can take you out of a film like bad CG, I didn't mind the Zatoichi stuff at all, and I haven't got around to Miami vice yet, but there are just so many examples of it. Dan, dvd or blu? It looks amazing on blu ray. I saw Postmodern life at the HKIFF a few years ago and I agree it's a really good film and Chow was great in it. It does take a rather depressing turn towards for the last half hour though! A. I wouldn't let that put you off as it has plenty to offer to anyone, as long as you can keep up with the subs! Achillesgirl. I have no intention of stopping anytime soon, thanks for the encouragement! Wow, you really like "Let the Bullets Fly"! I, OTOH, have more equivocal feelings about it. On one hand, I was entertained by much of it. OTOH, its light humored take on violence and death -- some of it pretty gruesome -- actually chilled me quite a bit. Hi YTSL, I haven't seen Devils on the doorstep yet, but I'm seeking to rectify that asap. I didn't mind the light humoured take on the violence YTSL, after all it's not the first movie to handle it this way and the whole film did feel quite satirical, at least to my eyes! Interesting comment Dan, and it's a valid one where most HK blus are concerned. There are exceptions however. The Kino release of Fallen angels looks amazing for instance! Thanks for the review, wasnt sure about this film but you have convinced me to check it out. Most HK blu rays of recent films are great, its just the older classics that are getting poor HD treatment. ACC, Yeah, the problem is these old titles are putting people off from upgrading at all, meaning everyone suffers as the companies won't then spend the money to release proper masters! I know what you mean about "Let the Bullets Fly" not being the first film to treat violence in a light hearted way. Somehow though, it struck me as unusually callous in this movie though. For clarity, I was saying that the HD TV technology, rather than the discs, is what puts me off.